ROME (AP) -- The head of one of Italy's ruling parties insisted Friday that the country won't exit the euro currency bloc nor exceed its targeted deficit limit, dismissing the European Union's worries about the populist government's budget strategy. 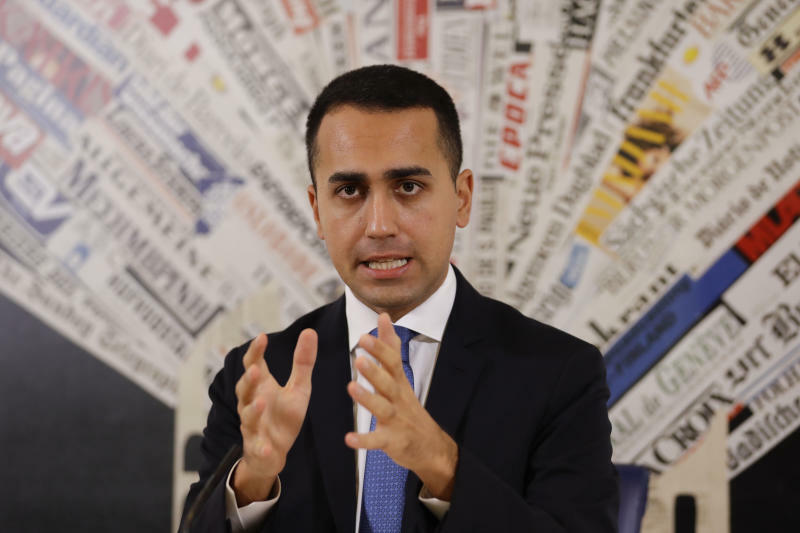 Deputy Premier Luigi Di Maio, who heads the main party in the five-month old coalition, told foreign correspondents in Rome that he "guarantees" that domestic spending cuts plus economic growth spurred by public investment will keep the country from overshooting its deficit target for next year, as EU officials fear. "There's still a lot to cut," Di Maio said. "The guarantee we're giving is that 2.4 percent (of GDP) is the maximum deficit term" Italy will run up next year. He brushed off concern that Italy might incur EU sanctions if it sticks to its deficit target. Meanwhile, the head of the 19-member eurozone's finance meetings sidestepped questions on whether Italy might be hit with a EU fine. "One thing at a time," said Mario Centeno, Portugal's finance minister who heads the so-called eurogroup and had just emerged from talks in Rome with Italy's economy minister, Giovanni Tria. Centeno preferred to speak of an overarching concern in Brussels. "Beyond the rules, sustainability is the heart of the discussion," Centeno told reporters. Tria gave no indication Italy would budge on its budget plans to please the EU. Flanking Centeno, Tria said that if avoiding sanctions were the goal, "we would have to make a very violent budget maneuver of fiscal restriction." That, he argued, "would be suicide for an economy in marked slowdown." Italy's economic growth has been sub-par for years. There are doubts within Italy, too, about whether the government can achieve its economic growth goals with its proposed budget. An Italian central bank official, deputy director Luigi Federico Signorini, told lawmakers Friday that the government's growth forecasts for next year are "ambitious." The EU expects the Italian economy to grow only 1.2 percent next year, the lowest in the eurozone. The Italian government expects a more optimistic 1.5 percent growth.